The purpose of my trip to Hanoi was to visit Halong Bay. It was indeed worth the 3.5-hour mini-van journey from Hanoi. 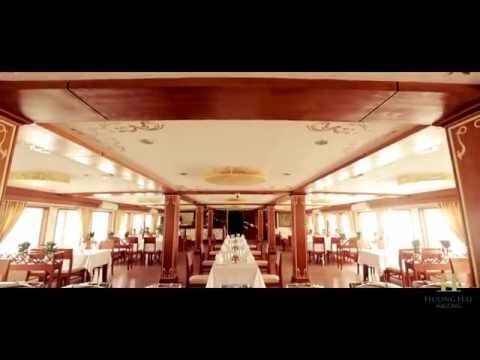 I booked a 2 night cruise on Huong Hai Sealife Cruise. After a few exchanges of email with its sales representative Ms Nga Nguyen, I made my purchase through PayPal. Initially I was hesitant in pre-booking, but I promised Ms Nga Nguyen that I would write a good review if my trip turns out to be a good one. In fact, it was superb. On the first day, we were picked up at our hotel in Old Quarter promptly by a 13-seater mini-van. We drove past interesting rural and agricultural areas, in stark contrast to the built settlements in Hanoi. When we arrived at the pier, a ship's personnel came to welcome us and tag the baggage to be checked in. We took a tender boat from the pier to the ship (approx 10 mins). Wearing lifejacket is a must, after safety measures have been stepped up by the local authorities. The final stop was Titop Island for beach-goers. Bath towels are provided for Huong Hai cruise passengers (not too sure if other cruise lines provide them as well). 1 hour on the beach before returning to the ship. Activities on board include Vietnamese spring roll making session on the first evening before gala dinner, squid fishing after dinner, and Taichi session on the next morning before a visit to Luon Cave by either kayaking (USD18 per pax) or traditional row boat (included). We checked out of our cabin and had our breakfast on board at around 9am, after visiting Luon Cave. Remaining time was spent on the sun deck until approx 11.30am when we arrived back at pier. Waited for about an hour at a pierside lounge operated by the ship's company before our driver came to pick us up. Reached Hanoi around 4.30pm. So plan your activities or flight only after that time.